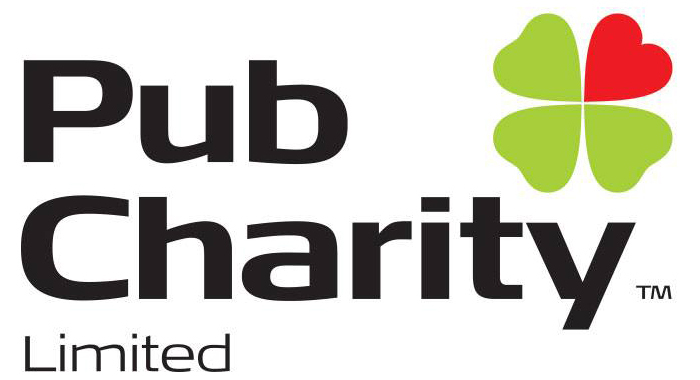 I joined CCATS in 2004 as a teenager with my King Charles x Poodle Zara. Zara was a fantastic first dog, she wasn’t the fastest but very reliable. In 2007 I got Jez a Poodle x Lhasa Apso, she has been a reasonably steady dog but has had issues with being timid. 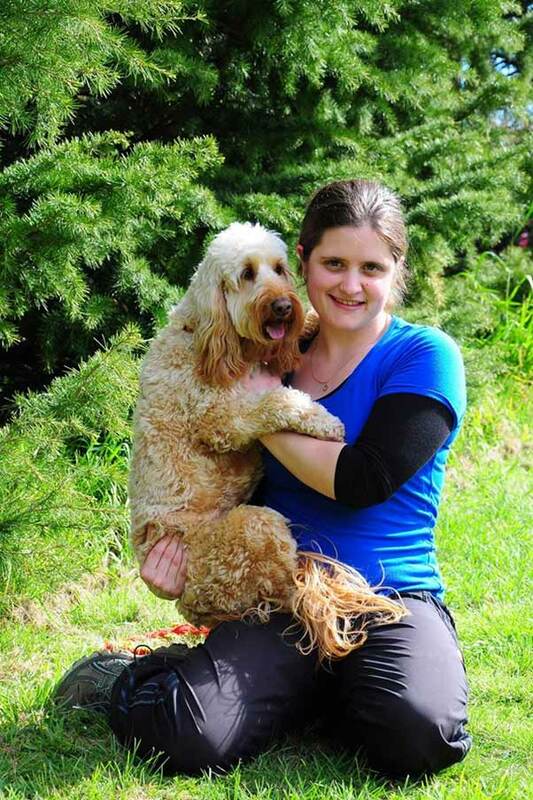 In 2011 we got Holly a Cocker Spaniel x Mini Poodle who I now primarily train and am learning the new European handling with. Holly is my parents dog so since getting married November 2014 I no longer live with the main dog I train which does make things a bit challenging. In December 2014 my husband and I got a re-home dog from trade me Bob the Border Terrier x Fox Terrier. It has been quite challenging having a re-homed dog particularly a terrier but he is great fun. 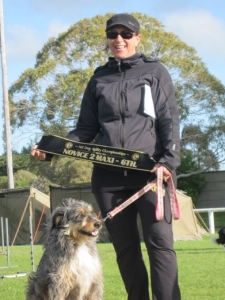 I have represented Zone 4 twice at NDTA/NZDAC in 2009 as the starters dog with Jez and 2013 as the starters dog with Holly. I will be working with you to perfect the 2 on 2 off contact skill. I am a stay at home mum of two girls but I’m never home!!!! 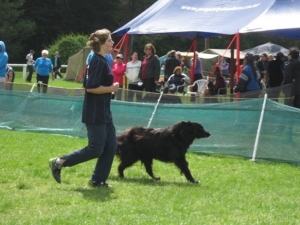 I started agility at CCATS many years ago (12 I think) and got my very stubborn border collie cross up to intermediate just before he had to retire, although he didn’t want too. He taught me a lot and things in the agility world have changed considerably now and for the better. With the internet at our fingertips and some great handlers doing fantastic teaching I’m honoured to be asked to teach you the 2×2 weaves which i felt extremely useful when learning with my new dog “Pippa” a completely mad bearded collie X. It is something though that needs to be practised at home most days so be prepared to put in 5 mins each day and you will be so amazed at how quickly your dog can achieve this very difficult task. I look forward to meeting you all next week, Make it fun as that’s what agility is all about. I’m president of Canterbury Canine Agility Training Society. I have been a member of CCATS for approximately 20 years. I’m the person you come to with problems I will try to solve it or if I can’t solve I will point you in the right direction. 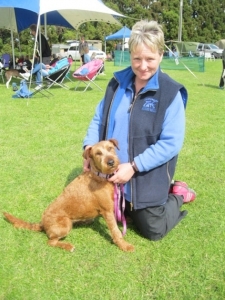 I have been a Primary School Teacher for the last 24 years and enjoy training kids and dogs. You will see me around club with a Mini Poodle named Pipi or an Irish Terrier named Finch. I have also been running some Mini Schnauzers but they have retired. I also dabble a bit in obedience, Rally O and now sledding. Four of my dogs are also qualified Canine Educators and worked with children in my classroom. You don’t have to be the tops to enjoy a show just get out there and have fun with your dog. You and your dog can find friendship of people that are of ‘like mind’. My main message is get involved, experience the sport of agility and if you do you can reap the rewards. I started my dog training career in Timaru twelve years ago with a Standard Schnauzer Zheddie, who competed with not a lot of interest in obedience but enthusiastically in agility. After a while, I gave in and we gave up obedience and Zed quickly taught me his preferred way of doing agility. After moving to Christchurch, I joined CCATS and now compete with my semi-retired other SS Schultz and a young Miniature Schnauzer Fritz, who is, and suspect always will be, a “work in progress”. Fritz is quite the fun character – he loves checking out “the girls” and posing for the camera (no action shots please, it would mess up his hair), is very intelligent but has little attention span or focus and is a real challenge! I have instructed in one discipline or another for nearly the whole time I have been involved with dog training and now take the class where competitors in Starters/Novice train.